Sitting for two hours in casualty did not improve my peace of mind. The nurse who saw me admitted having removed several from herself in the past, but only managed to pull the body off leaving the head inside my arm. She called a doctor who, with the aid of a magnifying glass and scalpel, performed microsurgery, removed the head, cleaned the wound, insisted in showing me there was nothing left in my arm and prescribed a heavy dose of antibiotics. Back home, an Internet search for the symptoms of Lyme Disease did not improve my state of mind. Apparently these little creatures feed off foxes, deer, dogs and the disease they carry can attack your brain, heart and other vital organs. I’ve shared an example of my stresses and worries – what about yours? Has it been an anxious week for you? Any sleepless nights? A racing heart beat? Raised blood pressure? It is at times like these that I turn back to the Scriptures and remind myself of the One who sustains all life. Through the Psalms, in particular, the Lord provides comfort, clarity and renews my strength. Today’s Bible reading is Psalm 121. As a child brought up in the flat countryside of the Suffolk coast I always dreamed of living somewhere surrounded by mountains. A holiday in the far north of Scotland recently revived my soul. I love the sensation of travelling, of sleeping out in the open, and of being surrounded by mountains. This beautiful little Psalm was arranged to be sung by pilgrims on their way up to the Temple, just as the mountains surrounding Jerusalem came into view. It was also intended to be sung in the late evening before retiring. 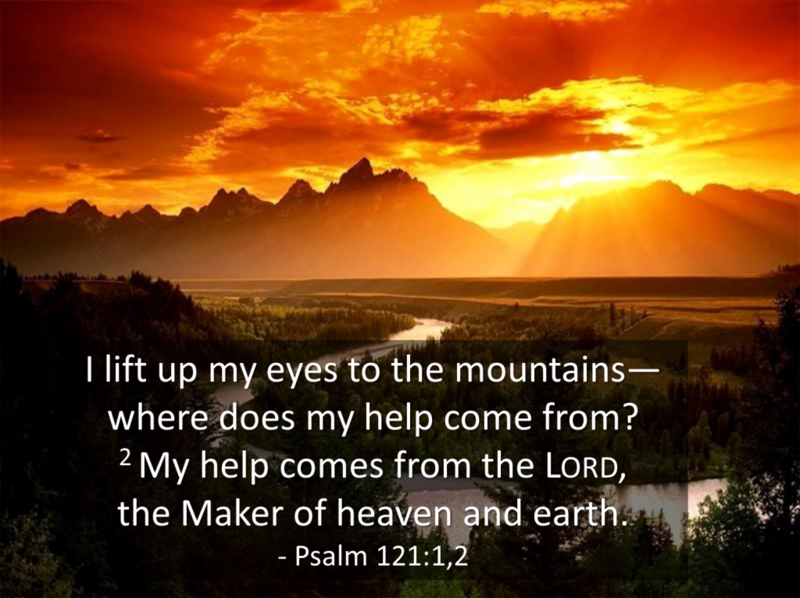 Psalm 121 is a song of hope and confidence in the strength of God. Hills are places of safety and hiding. Solid, firm, immovable. Instead of looking down at our insecurity, we are told to look up. Look up to the one who made the hills and mountains. Look up to the One who travels with us along life’s journey, and will be our Guide. In this short Psalm we are told about three specific things the Lord will do. He watches over you. This is more than merely observing what is going on. His watching is active, searching. A few years back, we had to cut short our holiday on hearing that our home had been burgled. The angels must have been watching because when the intruders smashed my study window to gain entry, a neighbour heard the noise and phoned the police. They arrived within minutes and caught all three. We were very fortunate. What ever happens to us, this Psalm tells us the Lord watches 24 hours a day. The Lord is greater than our Army, Police, Security Services, and all our Neighbourhood Watch schemes thrown in. Nothing, absolutely nothing can happen to you without the Lord’s knowledge and consent. What He does, He watches. Secondly we are told ‘how’? The word for shade comes from the Hebrew for shadow. The Lord is like a shadow, closer to you in fact than your shadow. As a child, do you ever remember playing a game of trying to run away from your shadow? It is just as impossible for a child of God to be separated from the over shadowing of our Heavenly Father. Thirdly, we are told ‘why’? The word to ‘keep’ means to preserve tenderly, just as eyelids are keepers for the eye. The lids open to let us see, they close to defend giving rest and sleep. The Lord promises to watch, protect and keep you safe. “Do not be anxious about anything,but in everything, by prayer and petition, with thanksgiving, present your requests to God.And the peace of God, which transcends all understanding, will guard your hearts and your minds in Christ Jesus.” (Philippians 4:6-7). Make that your prayer this Summer and may all your fears, your stress and worries evaporate like the morning dew. May the Lord bless you and those you love.